I recently went on the excellent Emergency Management of the Severe Burn (EMSB) course, run by the British Burn Association. I can’t recommend this highly enough – it is a really enjoyable one day course which gives you a good introduction into the management of the severely burned patient. Small scalds are pretty common but severe burns are (thankfully) not something we see all that much of in kids. EMSB does mostly focus on adult patients (with a small section on paeds) but a lot of the principles are the same. 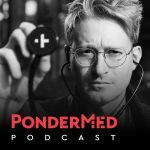 Nothing will substitute going on the course yourself, but here are a few condensed pearls of wisdom as a teaser. This is Jackson’s Burn Model. Look at the zones on the diagram (ignore the tissue depth for now). At the centre of the burn (the point of maximum heat exposure) the proteins are denatured (zone of coagulation, or zone of necrosis). This tissue is necrotic and doesn’t recover. Surrounding that is the zone of stasis. Circulation here is slow, affected by damage to the microvascular structures. If the burn is untreated, this area can easily become necrotic. 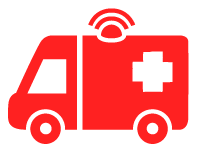 BUT – if good first aid is given, this area could recover. 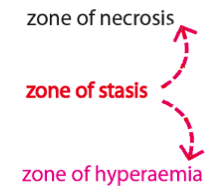 At the outer edge is the zone of hyperaemia. The capillaries are dilated in response to inflammatory mediators. This area will return to normal as the tissue response to the burn resolves. I’ll come back to this in a moment and explain why it’s clinically important. Burnt skin releases inflammatory mediators, causing vasodilation. There is also a breakdown of intracellular ground substance and the spaces between endothelial cells open up… all of these factors make for leaky capillaries, which lose fluid and albumin into the interstitial space, causing oedema. The really important thing to note is that if the burn covers over 10% of body surface area (in kids) or over 20% in adults, the release of inflammatory mediators is so great that the whole body is affected – meaning that albumin loss and oedema can happen throughout the circulation, NOT just at the burn site. This is why severe burns patients are at massive risk of hypovolaemia and why fluid resuscitation is so important! Burn Wound Assessment – How Deep? The depth of the burn is usually NOT the same in all areas of the wound, so detailed examination is essential. Blisters can hide the depth of burn in underlying tissue, so blistered skin (which is dead) should be removed for proper assessment. Dermis – contains blood supply and sensory nerves. Also contains sebaceous glands, hair follicles. 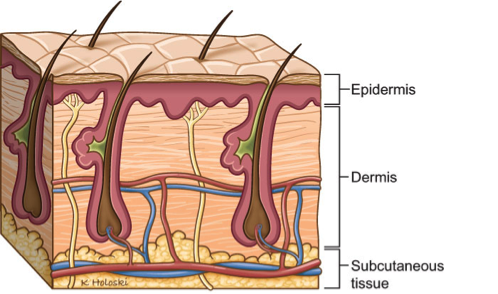 The reservoirs of epithelial cells surrounding these structures can heal a wound by epithelialisation. 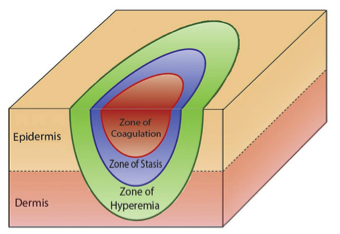 As Jackson’s model shows, the zone of stasis could become necrotic, or could begin to heal. This is why reviewing the burn wound 2-3 days after the initial injury is essential – at this point parts of the burn may have progressed to necrosis (or might have started to heal) in which case your original assessment of the depth of the burn might no longer be accurate. Burnt skin releases inflammatory mediators. After a large burn, the effects of inflammatory mediators can be systemic, not just local to the injury. Burn depth is rarely uniform across the whole wound – examine in detail. Blistered skin should be removed to allow proper examination. Burns must be re-examined at 2-3 days after injury to check whether any areas were more severe than first thought. 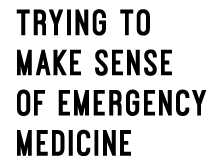 Dr. Katie Knight (@PEMGeek) is a paediatrics trainee in London, currently working at Homerton University Hospital. She has completed 3 years of training in general paediatrics and is planning to specialise in paediatric emergency medicine. She is passionate about innovative medical education and simulation training in PEM. She authors the excellent PEMGeek.com.